Paying with plastic now has a double meaning in Canada. The central bank has introduced a polymer-based $100 bill as our northern neighbor moves away from paper currency. The thin, shiny, high-tech, recyclable bill, released Monday by the Bank of Canada, is reportedly almost impossible to rip and thought to be nearly counterfeit-proof, according to the bank and news reports. Security features include holographic elements and a metallic strip running through a transparent window. The new polymer $50 bill goes into circulation in March, with the $20, $10 and $5 bills coming in 2013. 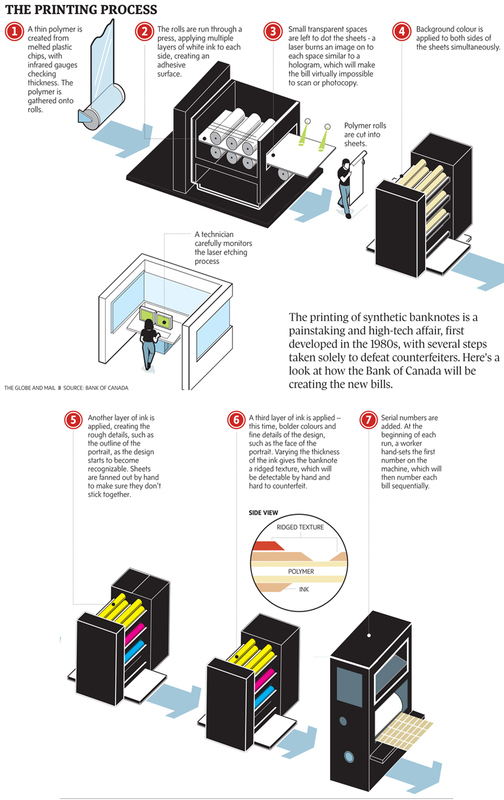 "We've been working with the market for over two years to make sure that ATMs and all banknote-processing equipment are ready for these polymer notes," the bank's scientific adviser, Martine Warren, told The Globe and Mail. "We distributed test notes and advance designs of the genuine notes to machine manufacturers far earlier than we have in the past to make sure that the circulation system is ready for these polymer notes." Canada joins about 30 other countries that have exchanged paper for plastic. Australia was first, in the 1980s. The Globe & Mail outlines the 'printing process'.